Peter Francis is an experienced and modern keyboard player and organist based in Bournemouth, Dorset. Peter can be booked to play a variety of music to suit all occasions such as wedding day entertainment, anniversaries and dinner dances, as well as strict tempo dancing. For Peter's customers that require a party keyboard player, Peter tailors his performance to suit the customers needs playing from a large range of ballads, pop songs, swings and sambas. Peter Francis also runs his business servicing and undertaking electronic keyboard repairs and repairs organs, pianos and amplifiers. Peter is a fully qualified electronic service engineer with over 35 years experience in the servicing industry. Peter carries out Roland and Yamaha keyboard repairs as well as most other makes of equipment. 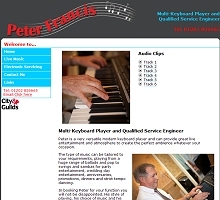 Peter Francis' is happy to attend venues for keyboard playing & repairs within a fifty mile radius of Bournemouth. this includes the areas of Poole & Weymouth in Dorset, as well as East Devon and Southampton in Hampshire on the South coast.